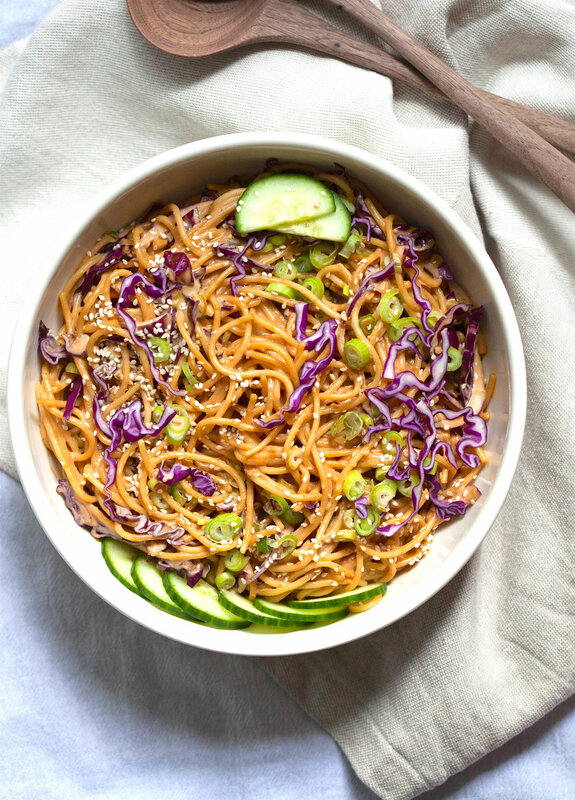 A wildly delicious Sesame Noodle Pasta with crunchy veggies wrapped in a peanut butter and tahini sauce from the Laura Lea Balanced Cookbook. I couldn’t be more excited to share a recipe from the lovely Laura Lea’s new cookbook, Laura Lea Balanced! Once I found out about Laura Lea, I feel so in love with her simple recipes that turn comfort food into a healthy affair. I remember first spotting Laura Lea on IG Stories, as she was recipe testing healthy blueberry donuts. I mean, healthy donuts?! I was sold and I knew that if anyone was making donuts healthy, then I needed to follow them, immediately. Then the next morning I opened to a gorgeous photo of blueberry donuts on IG! First, she made them sound delicious and now made them look utterly delicious. I tried the donuts the following weekend and was completely smitten! I adore Laura Lea for her genuine passion for sharing the types of food that empower and enliven your spirit and body. She is also a fountain of knowledge, sharing practical advice and tips on healthy eating, daily. Her genuine excitement for living a healthy lifestyle oozes from the pages of her book and website, making you want to cook every single recipe she’s ever made (I personally love her vegan lasagna and blueberry donuts)! She is a breath of fresh air in a space that can be at times restricting and diet limiting. This is weeknight comfort food at its best – pasta noodles twisted into a creamy peanut butter and tahini sauce, speckled with sesame seeds and crunchy veggies. A dish that is easy enough to make when you’re in a pinch for time, yet still exceptional enough to bring to a party for all your friends to enjoy. I devoured my plate in minutes and kept coming right back to the pot for another spoonful. The subtle aroma of nutty sesame oil perfuming the cream sauce is the richness that brings you back for more. I’m tellin’ ya, you guys have to make this one. It’s a keeper…as is everything in Laura Lea’s book. Thank you Laura Lea for sharing this amazing recipe with us! Was absolutely a pleasure reading your book and narrowing down my search for the perfect weeknight dish to this recipe (although, I bookmarked nearly 17 others!). Combine all ingredients except noodles, in the order listed, in a medium-sized mixing bowl and whisk to incorporate thoroughly. Stir half of the sauce into the bowl of noodles. Taste and add more sauce as you like. I add it all in, because I like really sauce-y noodles and I find they dry out in the fridge. You can also cover and refrigerate leftover sauce and add later. Place in a tightly sealed container in the refrigerator for at least 1 hour before enjoying. Noodles will keep for 5 days. And thank you to the lovely Laura Lea for sharing her delicious recipe with us! Her book is a gold-mine for healthy recipes with simple tips and tricks to implement into your everyday life. Enjoy!